Home / AKID slippers / Celebrity / Celebrity Style / Fashion / KIM kARDASHIAN / North West / STYLE / NORTH WEST OUT AND ABOUT WITH AKID FURRY SLIDES. 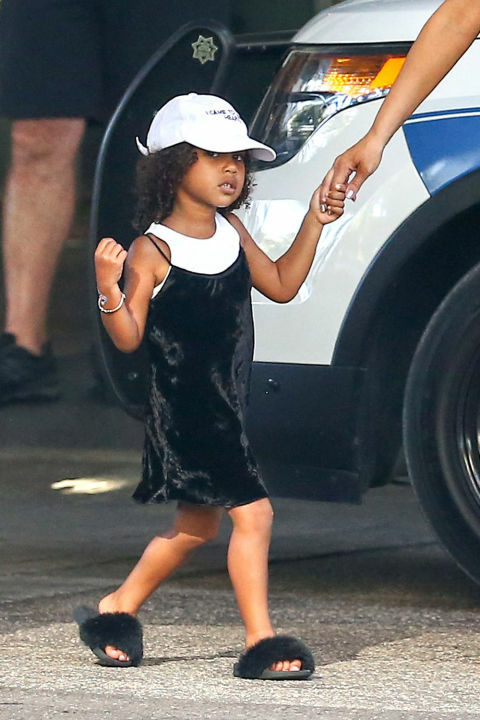 NORTH WEST OUT AND ABOUT WITH AKID FURRY SLIDES. Just lately Kim Kardashian ali-tweet to thousand of her follower explaining kwamba huwa wanampa uhuru North Kuchagua material ambazo anataka nguo zake zishonwe and kuwa a ot of the things she wears huwa anachagua mwenyewe. Iguess the kid is a natural born fashionista. So North West was spotted with mommy Kim Kardashian wearing AKID furry slippers with a velvet slip dress, white t-shirt and dad hat.